Like many objects, watches are a currency. They can be traded and purchased. 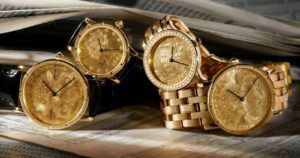 Their value fluctuates over time — though it mostly goes up — and the more rare, the pricier the timepiece. 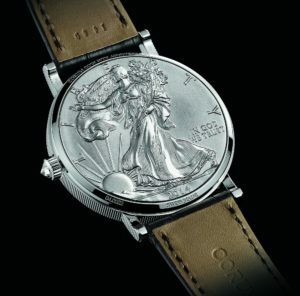 So what should we think about when the watch is actually made from a piece of currency? That’s exactly what the coin watch, produced by Corum and Cartier, does. It’s a watch either made by cutting a coin in half while also doubling as the dial. The coin watch works by slicing the coin in half with one thinner half and one thicker half. 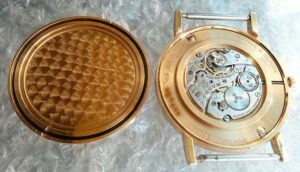 The watch movements are embedded into the thicker part and then closed with the other half. 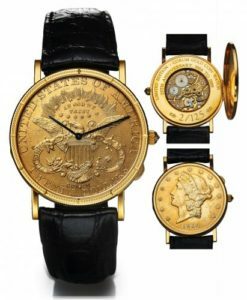 The watch received fame on the cover of Time magazine in 1980 when new president Ronald Reagan was seen on the cover wearing a Corum coin watch under a headline touting his new “Reagonomics” economic plan. 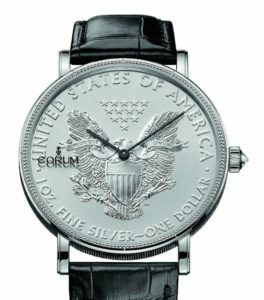 In 2014, Corum made its 50th anniversary coin watch with a silver dollar, 43-millimeter diameter coin with a 42-hour power reserve. Another, more luxurious anniversary option was that made from a $50 gold coin. 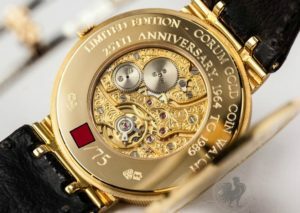 If you or someone you know was able to come in possession of a Corum coin anniversary watch, consider yourself lucky. Only 100 of each model were made, making them a collector’s item for sure. And also meaning their resale greatly value will exceed their value in coin. I don’t think you mean 42 hr. battery life. Great stuff, very interesting. Thank you Mark ! If you cut the coin in half and one half is thicker than the other half, you haven’t cut the coin in n half. You’ve cut it in two, but not in half. Hi Mark.Every time they have a Rolex on Antiques Roadshow,I just about flip out.The Submariner they had on last week was purchased in the 60’s for under $200.00.Today,it is valued at between $15K and $17 K.Excuseme,But I have to run.Rolex fever is setting in.HeeHee. Thanks Mark, very interesting stuff!!!! Never knew they made a coin watch. 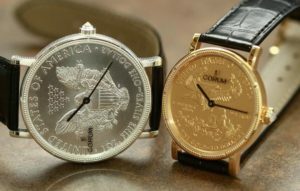 I always liked the Corum coin watch! Section 331 of Title 18 of the United States code provides criminal penalties for anyone who “fraudulently alters, defaces, mutilates impairs, diminishes, falsifies, scales, or lightens any of the coins coined at the Mints of the United States. On the other hand, many people people think that it is illegal to incorporate coins into jewelry making. This is not true. It is illegal to deface US currency if the intent is continue to use it as legal tender after it has been altered. Using it as jewelry makes this a moot point. I had a question and found the answer! To me, these are the most beautiful watches ever. During my first year in art school in NY, I worked part time at a smal ad agency that had the Corum watch account. They would send me up to an office on 55 St and 7 Ave. to pick up watches to use in ads, then I would return them. Once I peeked in the bag and looked at the invoice. I had more than $15,000 worth of watches, $105,000 in today’s dollars, and one was the gold coin watch. I even got to take them to a photo studio for test shots and got to be the hand model. The ad for the coin watch ran in The Wall Street Journal and NY Times, full page. The headline was One watchmaker, one watch.